Donations via Paypal are not tax deductible. See below for tax deductible options and mail options. Check the monthly donation box to give the same amount every month! We really appreciate monthly donations, which provide a steady stream of reliable income for NWTRCC! You will be charged automatically and you can cancel at any time through your Paypal account. Online: Give a one-time or recurring monthly, quarterly, or annual donation through RESIST and it will be tax deductible the extent the law provides. 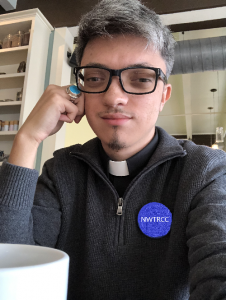 To ensure your donation gets to us, on the donation page, in the box labeled “Do you have any additional comments for RESIST?”, tell them the donation is for NWTRCC. Please also send an email to NWTRCC to let us know that you are pledging through RESIST. By Mail: Contributions by check or money order, for $50 or more, made out to ROSC (Resources for Organizing and Social Change), are tax deductible to the extent the law provides. Send your check to NWTRCC, PO Box 5616, Milwaukee, WI 53205. We will forward it to ROSC. NWTRCC accepts bequests, which can be arranged through your will or other estate plan. Simply name NWTRCC as the beneficiary of a portion of your estate or of particular assets in your estate, or contact the NWTRCC office for arranging a bequest through one of our 501c3 fiscal sponsors. A bequest costs nothing now, yet it may give you great satisfaction to know that your gift will live on in NWTRCC. More information: (800) 269-7464 or nwtrcc@nwtrcc.org. tabling at events and conferences, including School of the Americas Watch, Veterans for Peace annual convention, US Social Forum, and more. If you would like more information about NWTRCC’s finances, see our recent annual reports. Please contact us with your questions, comments, and ideas.